We remember when we first started giving talks on homeschooling – sharing our experiences and encouraging those intending to start, we addressed audiences of (almost exclusively) women. Now, things are changing. 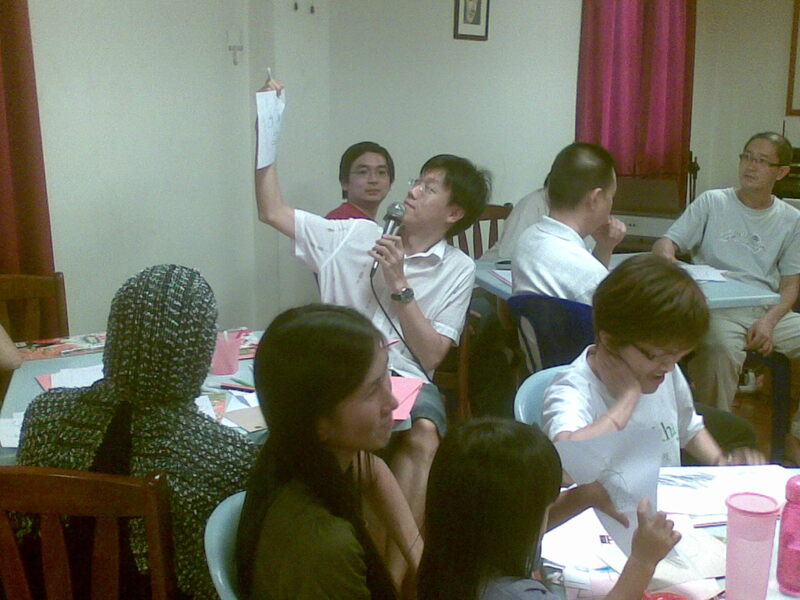 A dad in action at our recent workshop. Notice other dads around? That was about some years back. Very often the wives had to dragged their husbands and K V was the one having to face them. However, over the past year or or so, we noticed a more gender-balanced attendance to our talks and workshops. The last workshop was particularly inspiring. Fathers came, participated and at least one homeschooling dad stood up and spoke out! This entry was posted in Activities, Conferences & Seminars, Our home schooling experience, Seminars, Conference Dialogues & Talks, Thoughts and Ideas. Bookmark the permalink. 3 Responses to Great to see Fathers! -exposure to buddhist education tells me to watch all of the above. Thank you for all the effort. One never stops learning. The minute we decide to stop learning, we are dead – kaput! Good to see parents getting involved in their children’s education. In fact, home-schoolers are privileged: we don’t have to put up with the Siti Inshahs, the Math-Science in English policy changes, da da da. Best wishes to you all.